For this new AD forest, I've been leveraging on someone else KMS service. As it grows bigger, time to setup its own KMS host. It's pretty straightforward to migrate KMS server. Plenty of step-by-step online like this. I have also manually updated the _vlmcs._tcp SRV record on DNS server. And there is a problem. If you attempt to activate small number of new KMS clients after migration, it would report insufficient count. For KMS to work, you would need at least either 5 KMS servers or 25 KMS clients. So, I tried to re-activate existing machines by uninstalling existing KMS client key and re-installing it. The count level on the KMS host still won't jump and remain under 5. You can see the current count level by entering "slmgr -dlv" on the KMS host. After going through all the slmgr options, I noticed an option to disable KMS host caching. Could it because the existing machines still activate on old KMS server? Hurry, the count is raised! New KMS clients are activated at once. 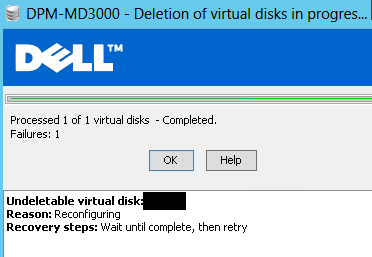 How to delete Virtual Disk in Dell MD during Operation? How to delete Virtual Disk in Dell MD during operations? Answer is you can't, you've to wait for the operation to complete. That sounds fair but not when you've waited several hours (if not days) for the operation to complete. Power cycle the MD storage still can't abort the operation. From the DellMD manager console, you've absolutely no idea to know when it would ever complete. The next best news is that you can run a command utility "smcli.exe" to roughly gauge the progress. This is typically found under "C:\Program Files (x86)\Dell\MD Storage Manager\client" folder. "VMM cannot find the Virtual hard disk object' error 801"
You may need to run a SQL script to remove the orphaned objects from the database by following the steps below. 1. Stop the System Center Virtual Machine Manager service on the VMM 2012 server. 2. Back up the Virtual Manager database. 4. Start the System Center Virtual Machine Manager service again and refresh problem VMs. The VMs should return to a proper reporting state. "Unable to perform the job because one or more of the selected objects are locked by another job." The replica of Microsoft Hyper-V \Backup Using Child Partition Snapshot\[VM] on [Host] is inconsistent with the protected data source. All protection activities for data source will fail until the replica is synchronized with consistency check. You can recover data from existing recovery points, but new recovery points cannot be created until the replica is consistent. 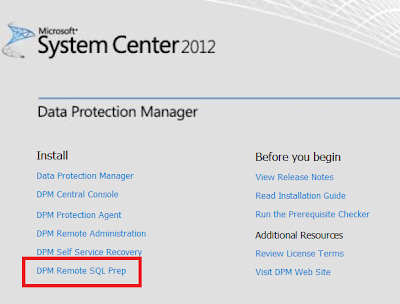 This Technet link describes the setting up of remote SQL server of Microsoft's latest backup solution - System Center Data Protection Manager (DPM) 2012 SP1. A missing step is not mentioned for using remote SQL instance (i.e. SQL not installed on same server as DPM). 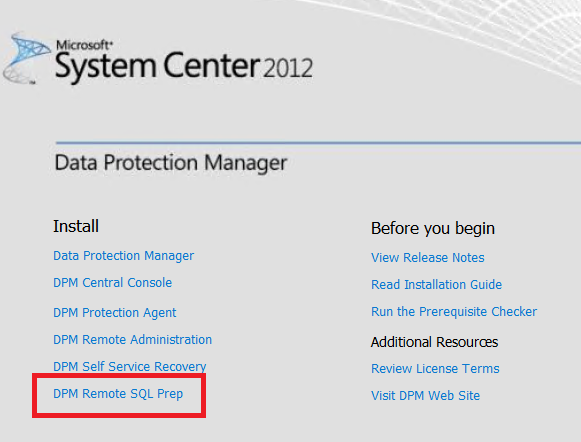 You'll have to run the "SQLPrepInstaller" on the SQL server. Insert the DVD, ISO or file share image of DPM installer on the SQL server. Click on the following menu on the launcher. If you run into any difficulties in activating or uninstalling Office 2010 Key, run this command at "C:\Program Files\Microsoft Office\Office14"
A list of options would be displayed. If mails are stuck in draft or Outbox, try restarting the Exchange Mail Submission service on the client access server. apply this hotfix (KB 2803748) on all your cluster nodes and/or the RSAT machines immediately. We have an application that requires to store some custom user attributes on the Active Directory. Let's say we need to add a custom attribute "Gender". How should we go about it? We need to first extend the existing User Class in the AD Schema. Please refer to this detailed step-by-step guide. Here, I would just summarize the overall steps. Step 1: Register AD schema tool by running "regsvr32 schmmgmt.dll" on the Domain Controller with "Schema Master" role. Add the AD Schema tool on the mmc console. Step 2: In the AD Schema Console, right-click the Attributes folder, then select Create Attribute. Step 3: You may like to generate your own private enterprise OID (Unique X.500 Object ID) for this custom attribute on this link. Step 4: From the Schema Console, click the Class folder. Scroll down to the User class, right-click it, and select Properties. On the user Properties dialog box, click the Attributes tab. Click Add, then choose the Gender attribute. Click OK twice, and you've successfully added the Gender attribute to the User class. Now we have an extra gender attribute for every user object. How should we populate its values (i.e. Male or Female)? If you have an excel sheet, convert it to CSV and use Powershell script to populate it. Below is sample script. Write-host "Setting the gender of $sAMAccountName"
The new SCVMM 2012 SP1 supports bare-metal host deployment. I was wondering if the host has multiple network connections, how would the right address be assigned from the right IP pools? Even if you've pre-patched the cables, the NIC order would change randomly once you've sysprepped or installed a new OS on the server. It had been a pain for server administrators to identify which NICs are connected to which network segments or VLANs. Look like if you know the CDN of each NIC, you can now pre-allocate the static IP address from the IP pool! CDN ensures that the NIC name and the printed name on the server chassis remain consistent. It's good news for every system administrator. Bad news is that CDN is only supported on WS2012 and you'll need the newest server hardware e.g. Dell's 12th generation hardware. Without CDN, you would have to supply the individual MAC addresses of each interface and match them to the defined IP subnets as shown below.